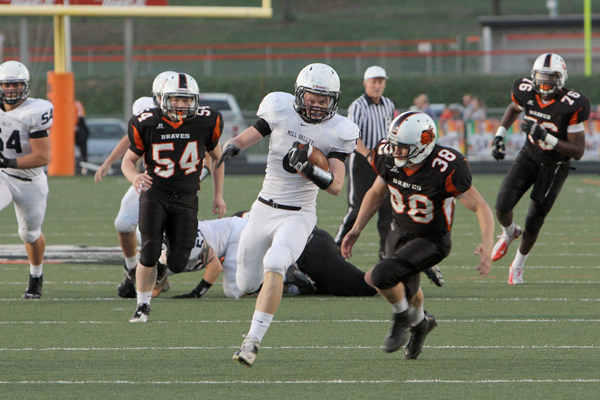 After dropping a heartbreaker in overtime last week, Bonner Springs head coach Lucas Aslin said there may have been a bit of a hangover coming into their Kaw Valley League matchup with streaking Mill Valley. However slight it may have been, the Jaguars made it a whole lot worse. Mill Valley put the hurt on the Braves behind quarterback Skyler Windmiller’s six touchdowns in a 49-12 reaming Friday night at Bonner Springs High School. The Jags wasted no time in putting this game out of reach. After a good kickoff return put the ball at the Braves’ 43-yard line, Windmiller would go four-of-four on the opening drive, capped off with a four yard pass to Staton Rebeck, his first of three touchdown catches on the night. Just 2 llater, Rebeck would inflict some déjà vu. After Bonner Springs fumbled on their first play from scrimmage, Windmiller would find Rebeck on a 27-yard touchdown grab on the first play of their second drive. The Braves would not be rolled just yet, however. Darian Neal would take the ensuing kickoff to the Mill Valley 32, and quarterback Jordan Jackson would do the rest, ripping off a 26-yard run and punching it in from six yards out. The extra point would be blocked, and the score would sit at 14-6. But the Jaguars would take no breaks, going 67 yards with Windmiller completing his tenth pass of the night, once again to Rebeck, this time from two yards out for the score. Bonner Springs would fumble again at the Mill Valley 30, but Windmiller would give the ball right back to the Braves with a fumble of his own. The Braves could not take advantage, giving the ball back to the Jaguars at their own 30. That would be a bad idea, as Windmiller would find L.J. Hatch and he raced 67 yards to give the Jags a 28-6 lead. Windmiller would finish the first quarter 11 of 12 for 160 yards and four touchdowns. The Braves would get one more on the board in the second quarter when Jackson would drive the Braves from their own 22 with two big runs and then find Mason Roberts twice, finally from seven yards out, to cut the Jags lead. After a failed two point conversion, the Braves would find themselves down 28-12. Jackson would finish 13 of 24 for 146 yards with a touchdown and interception, while running 19 times for 155 yards and another score. That was as close as it would get. Rebeck would take the kickoff down to the Braves 39. The Jaguars would get the ball down to the four yard line before being held up on third down, but Rebeck showed he can do more than catch, passing to Tyler Garrison on a fake field goal with :56 left in the half. Windmiller would add two more touchdown passes to Hatch, one from 42 yards out and another from 23 before giving way to the backups, finishing 17 of 24 for 257 and six scores. Windmiller added 79 yards on the ground on 13 touches. Mill Valley did, however. Applebee attributes it to his team’s preparation all week for the game. Since dropping their opener, the Jaguars have outscored their four conference opponents 211-25. The Jaguars next face Piper in what looks to be the battle for the Kaw Valley League crown with both teams coming in undefeated in conference play. As for the Braves, they go back to the drawing board with Basehor-Linwood visiting Bonner Springs High School.